Hilton Mauritius Resort & Spa has a lot to offer in a beautiful location - try water sports or unwind on the Indian Ocean beach. The hotel is using boodi Beach Ashtrays to prevent cigarette litter on the beautiful beaches - maintaining a clean environment for all visitors. Our Beach Ashtray is perfect for all hotels, as it looks like a postcard and can be left in the hotel rooms as part of the visotr pack. The Royal & Imperial Belverdere Hotels are located in Hersonissos, Crete. 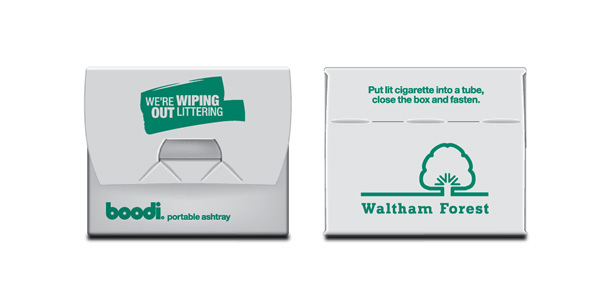 The company is proud of its commitment to the environment and recognises that it may have a direct or indirect effect on the local environment, which is why they chose to use our eco-friendly portable ashtrays - to give smokers a convenient way to dispose of cigarettes and prevent cigarette litter. 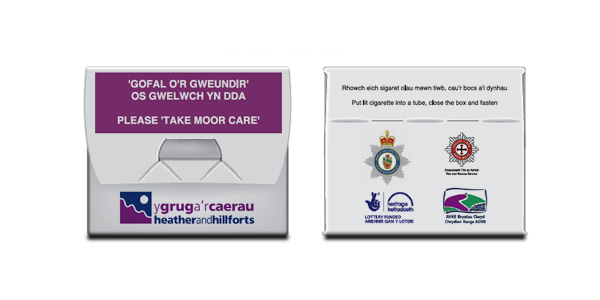 Keep Wales Tidy is the group that was setup to raise awareness of litter issues and change attitudes towards litter, with the view of maintaining a clean and tidy Wales. 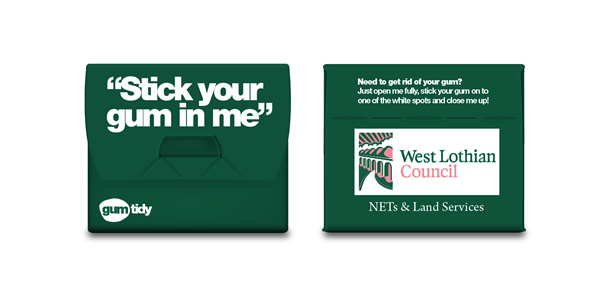 Keep Wales Tidy works on a number of initiatives; covering town centre streets, beaches and areas of the countryside in an attempt to improve local environments. Limetree Festival is an independent music festival in the heart of North Yorkshire. It offers diversity, friendliness and a lot of fun. The boodi team attended Limetree Festival 2011 and loved it! There was a lot to do and see; the music was great and it was full of family spirit - with people young and old enjoying the entertainment and each other's company. It's definitely a return to how festivals used to be! 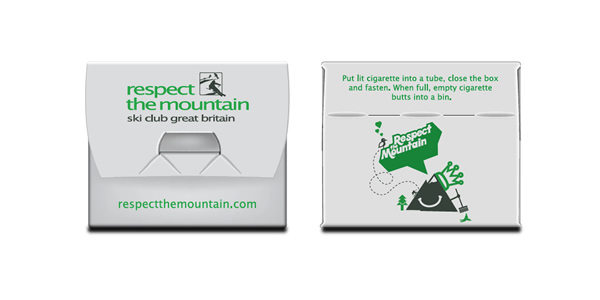 Respect the Mountain is an environmental initiative led by the Ski Club of Great Britain, the UK's leading snowsports organisation. The Respect the Mountain campaign raises awareness with regards to environmental issues, funds environmental projects connected to snowsports and offers educational information to skiers, snowboarders and the snowsports industry about how to protect the future of our mountains. 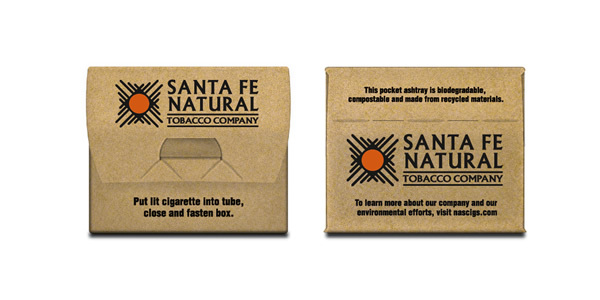 SFNTC is a tobacco company that produces natural, organic tobacco in an Earth-friendly manner, which includes buying electricity from wind power and using recycled materials wherever possible. 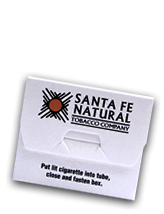 SFNTC chose our portable ashtrays because they are made from recycled, recyclable and biodegradable materials, which suits their strict environmental policy very well. 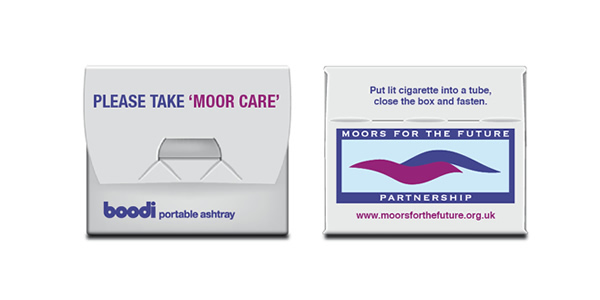 An organisation focused on restoring large parts of the Peak District Moors, many of which have been fire-damaged as a result of carelessly discarded cigarettes. 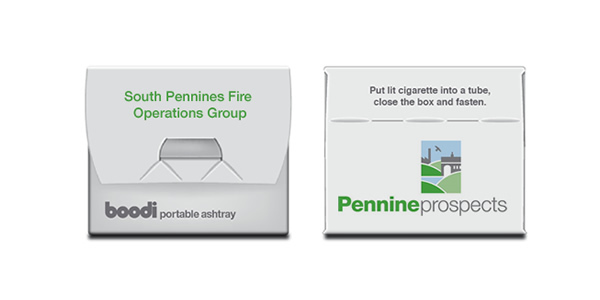 They bought our portable ashtrays to prevent such fires in the future. The Forestry Commission is the government body responsible for protecting and managing woodland. 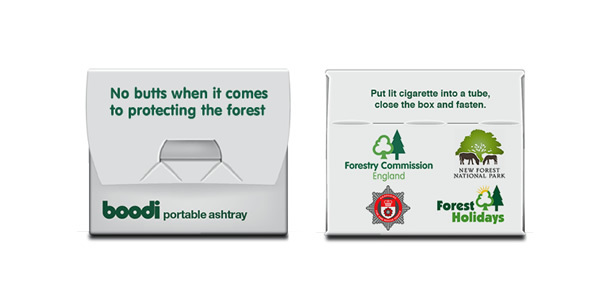 They teamed-up with other organisations to purchase printed boodi ashtrays in order to prevent woodland fires in England. 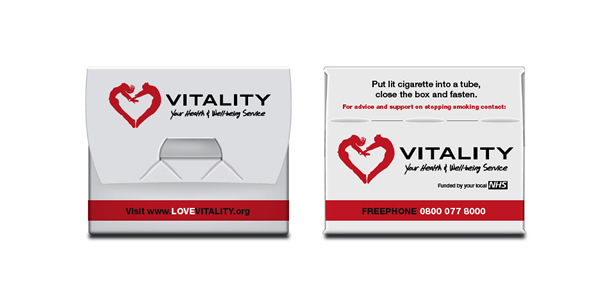 British American Tobacco is a global tobacco company that offers many brands of cigarettes, including Dunhill, Lucky Strike and Pall Mall. 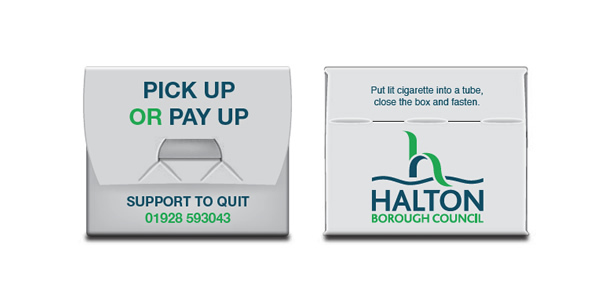 We have produced branded boodi portable ashtrays for multiple BAT offices throughout the world. 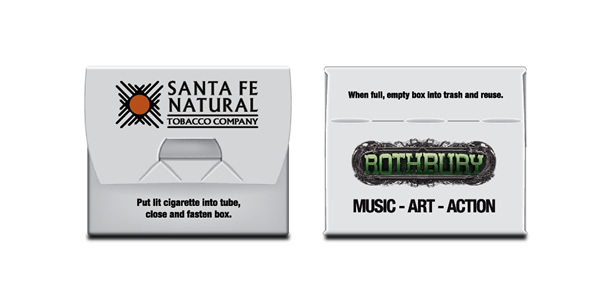 The organisers of Rothbury Festival, which is hosted in Michigan USA, have used our eco-ashtrays for two consecutive years now. The organisers have done a fantastic job of making the festival a low environmental impact event - which is the reason why they chose boodi. Zmar is the first Eco Camping Resort, which is based in Zambujeira do Mar in West Portugal. 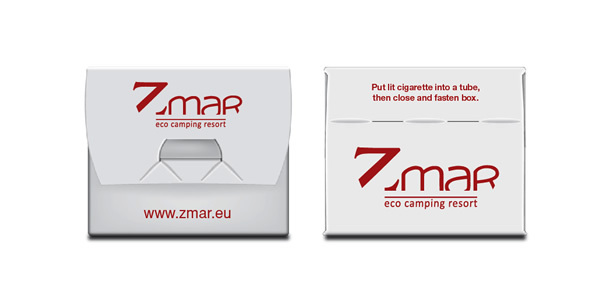 To mark the launch of their resort, Zmar bought a substantial quantity of our eco-friendly ashtrays, which they intended to give away to visitors at the resort. 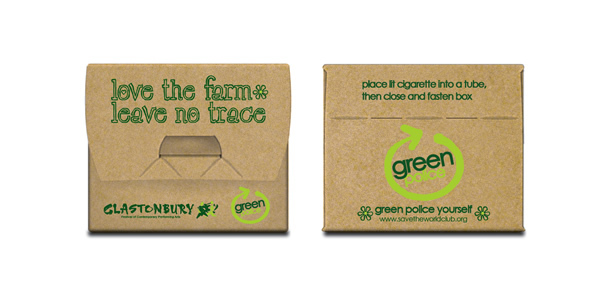 The Green Police, created by the Save the World Club, are a group of volunteers who aim to reduce litter at Glastonbury Festival in a fun and humorous way. 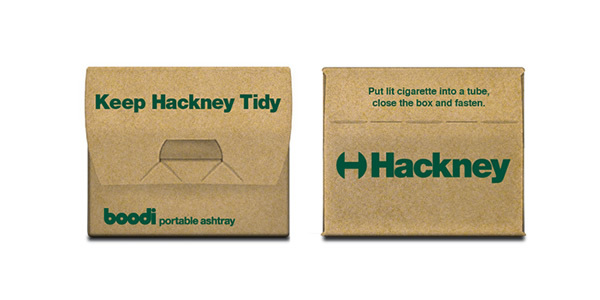 This year (2009) the Green Police used the boodi ashtray to tackle cigarette litter. 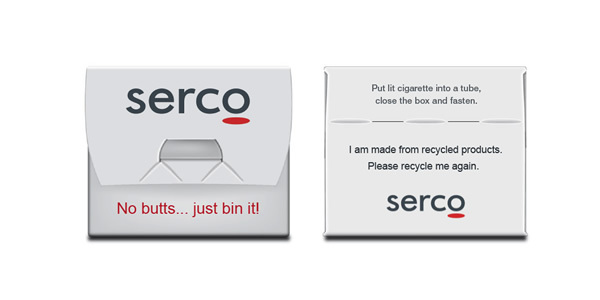 Serco is a FTSE 100 international service company that combines commercial know-how with a deep public service ethos. 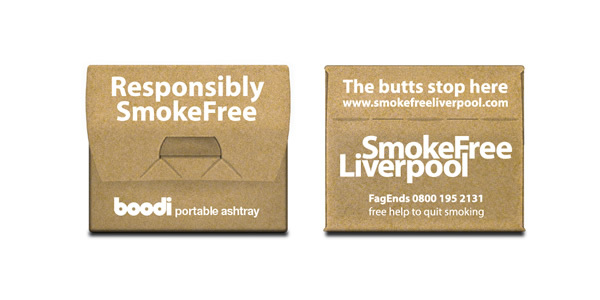 They used boodi portable ashtrays as giveaways to promote their company. 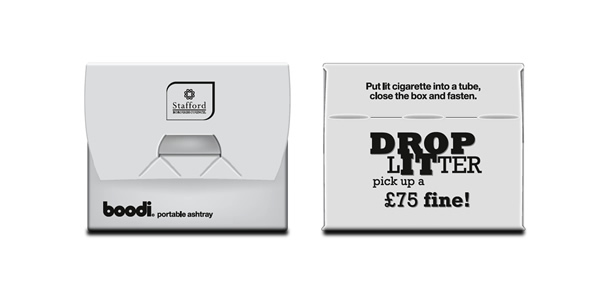 The University of Newcastle has used eco-friendly boodi portable ashtrays for multiple campus-based anti cigarette litter campaigns. 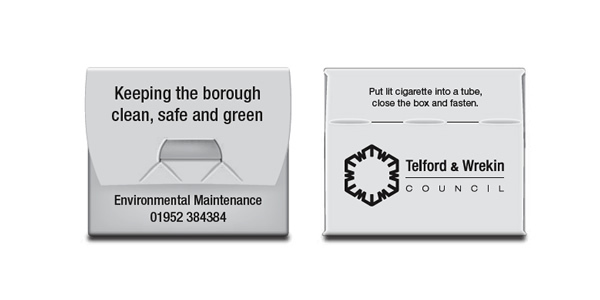 The ashtrays were handed out to students to give them somewhere to extinguish and store their cigarettes while on campus. TacLight is a UK specialist retailer of Tactical Flashlights, Gun-Mounted lights and everyday carry (EDC) torches for sports such as shooting and Airsoft. TacLight's online range includes torches by Olight, iTP Light and Solarforce. They used boodi portable ashtrays to promote their torches and give smokers somewhere to put their cigarette ends, instead of on the shooting or Airsoft field. Audio Trails are a cost-effective and unobtrusive method of interpreting heritage sites and tourist attractions, in both town and country locations. This is done by utilising iPod's, MP3 players, mobile phones and global positioning system (GPS) recievers. 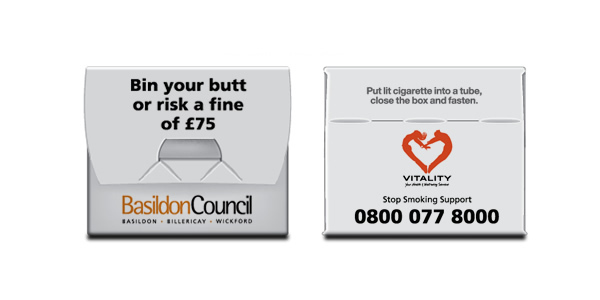 Promote your organisation, event or product to smokers with the eco-friendly boodi portable ashtray - the world's 'greenest' promotional ashtray. 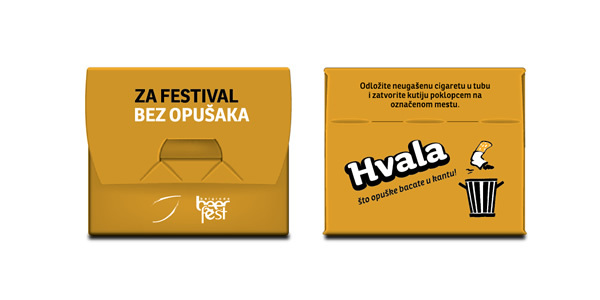 A fresh, new style of cigarette costume.